Master Pun-Yin is among the rare few authentic, classically trained Feng Shui Masters in the west. After completing a 15-year apprenticeship with her father, the world renowned Feng Shui Master Tin-Sun (天山居士), she built an international practice that includes numerous high-profile clients. 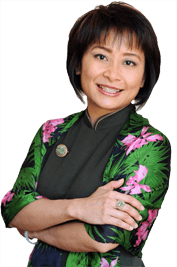 Master Pun-Yin is passionate about bringing balance to her clients' lives, which ultimately influences health, wealth and happiness. In the early 1990's, Master Pun-Yin and Master Tin-Sun collaborated to introduce Feng Shui to urban planning projects in New York City, including the revitalization of Times Square and Columbus Circle. Their track records of serving individuals and businesses around the world, combined with the success of these legendary projects, propelled Feng Shui into the global mainstream. Copyright © 2017 Master Pun-Yin/PunYin.com. All rights reserved.